Of the various software delivery processes under the agile umbrella, scrum became the most popular and is the most common implementation of agile in Corporate America. I like Scrum. I like its simplicity. I think that scrum's popularity is due to the fact that you can get quick business gains because it is quick to adopt 1. It is exciting to be able to watch a software system grow and change direction at will. This is in fact why agile exists and why it is called - agile. Managers like this concept and sign up for Scrum heartily for this benefit. There is an anti-pattern that I have noticed as a consultant working with Scrum implementations. While management is happy with their agile process and seeing new functionality being added every sprint, typically they are not budgeting for any maintenance. In the early days, this is easy to get away with, particularly on a new codebase or greenfield project. However, unless you are cleaning up after yourself continuously (particularly if you are cutting corners in the sprint) and fighting to keep the code clean, you will be incurring technical debt. It is subtle in the early days, and you will not notice it, but it starts to add up. The reason that we call it debt is that you need to pay it back at some point. The longer you wait to pay it, the more interest it has accrued and compounded. Not only are you not paying the compounding interest back, but you are also continuing to add to the debt by adding complexity to complexity and sloppy code onto sloppy code increasing the already compounded debt. The longer you leave the debt unpaid, the more effort and time it takes to fix the mess. This is what agile looks like without any discipline around cleaning up the code during each sprint and being vigilant to improve the architecture as it evolves. This is agile done wrong - which I see all too often in Scrum implementations, and has been called "Flaccid Scrum" 2. To dig yourself out of technical debt, it is going to cost you - a lot. On a long term project / large product, scrum (done poorly) creates technical debt. Too much technical debt left unpaid results in a Legacy System. The bullet points above describe a legacy system. Any of it sound familiar? Alas, it is not an uncommon situation. Did you have senior architects and senior developers when you created the original system? Now you have a new system, what are you doing differently to ensure this doesn't happen again? Then I point out that every day that I sync my laptop to their codebase, I am pulling in hundreds of new files. That is just not sustainable! They are on track to hit the same technical debt wall that they had in their original product and create a Version 2 Legacy system. If you carry on sprint after sprint delivering business value while disregarding code quality and architecture, you will end up with a legacy system. In a legacy system, the rate of adding new features decreases and the cost of adding features increases. You will not necessarily notice a drop in velocity however as the size of the stories starts to increase (to account for the complexity of working in a legacy system). Velocity will stay the same but the rate of adding new features decreases. (Which is one reason you should not use velocity as an indication of a team's performance.) You will also notice the bug count going up and much more time spent on fixing bugs. At this point, a business knows that things are going slow, but it can't work out why and starts to lean harder on the engineering department to produce more, which only results in them cutting more corners, writing more bad code and compounding the mess. Once a company realizes that they have dug themselves into a technical debt pit, they scramble to get out. A typical (anti) pattern I see is creating technical debt stories (or even sprints! ), refactoring stories and technical stories. If you find yourself doing this you need to change your development process as stories, by definition, are supposed to come with business value. More information below on how to improve your development process. You pay for quality one way or another. You either pay for it as you go (by building quality into your process) and create a system with a low maintenance cost that you can continue to build on, or you pay the price toward the end of the project (where it now costs more) and have high maintenance costs. The option that makes most economic sense is to pay your debt as you go. The only one tool to stop the natural code entropy toward technical debt is - Merciless Refactoring. Code Refactoring Definition : Code refactoring is the process of restructuring existing computer code - changing the factoring - without changing its external behavior. Each sprint you have to build SLACK into the sprint, so that you can MERCILESSLY REFACTOR the code, evolving the architecture (EMERGENT ARCHITECTURE) and keeping the code clean (CODE CRAFTSMANSHIP) to enable the business to be able to change direction on a moment's notice and keep the cost of change low. Refactoring is a scary word, particularly to conventional QA specialists and to management who struggle to see what value refactoring can bring. Which is why it is often not only avoided but actively discouraged. In fact, I agree that you should be scared of refactoring. Without other supporting disciplines/practices, refactoring is very dangerous! 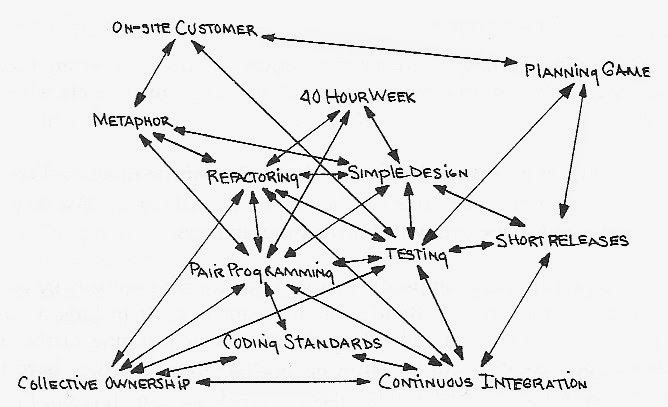 Extreme Programming is a suite of twelve disciplines, designed to work together to ensure code quality and enable refactoring, which in turn allows emergent design/architecture, which enables having a delivery model of changing requirements (agile). Because refactoring returns no new functionality, management often struggle to see value in the practice. The main value of refactoring is that you are not accruing technical debt and can therefore continue to add features and alter your system ad infinitum (with few to almost no bugs to boot). This goes part way to addresses the agile principle behind the manifesto of sustainable pace. Agile processes promote sustainable development. The sponsors, developers, and users should be able to maintain a constant pace indefinitely - Principle behind the agile manifesto. This is a graphic illustration of the sustainable nature that XP will give to your development process over scrum. The state toward the end of the graph is Scrum as a legacy system. In fact, XP helps fill in many more agile principle gaps that scrum leaves unanswered. Read on. Scrum is a framework, and its implementation is left up to you. Much of the implementation of today's corporate scrum has come from XP. This includes Stories, Story Points, Velocity, Continuous Integration, and Release Planning. When you take all the Principles Behind the Agile Manifesto and map them to Scrum and XP practices, it becomes pretty clear as to why you should be supplementing scrum with XP; supporting my claim of - Scrum is not enough. It is recommended that Scrum be complimented with XP 3, and it has been recognized that there are significant speed (5-10x) and quality advantages 4 in doing this. XP fills in these gaps, and more. To be successful in iterative development (e.g. Scrum), your developers need new skills and understanding. Software developers moving from waterfall to an agile delivery environment need training in agile development practices and ways of thinking in order to deliver software incrementally and architect a system while requirements are changing. If you carry on sprint after sprint delivering business value while disregarding code quality and architecture, you will end up with a legacy system (i.e., crippled with technical debt) with a high cost of ownership and many bugs. Code suffers naturally from entropy. A software system tends toward technical debt and legacy (if left unchecked). The ONLY way to fight this entropy is code refactoring. To refactor code requires supporting practices e.g., agile testing. 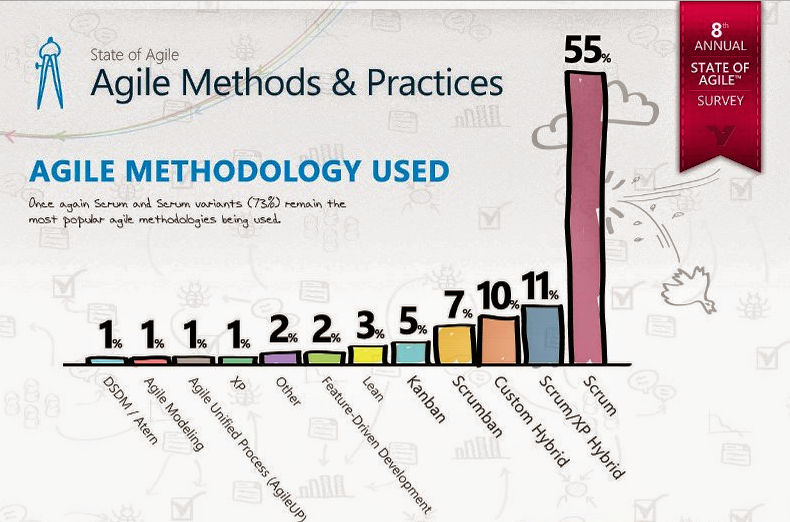 There are at least eleven other of these practices/disciplines, and the sum of all these practices are packaged together as eXtreme Programming (XP). XP gives developers skills in delivering and architecting a system for changing requirements - which Scrum does not. In a long-term software project, you need to supplement scrum with XP. Side Note - I came to this conclusion independently, but in writing this blog and researching references, I discovered that some of the content isn't particularly new. The thoughts of Bob Martin, Martin Fowler, Michael Feathers, and other thought leaders, in many cases, match my own observations. I find that encouraging. Incremental Delivery - The process evolving a software product by delivering working sub-portions (increments) of a system (typically on a cadence). Each increment typically builds further functionality on the previous, growing the complexity of the system incrementally. "the Scrum framework for software development was designed to get a team started in two or three days, whereas engineering practices often take many months to implement. Therefore, it left the question of when (and whether) to implement specific practices up to each team. Scrum cocreators Jeff Sutherland and Ken Schwaber recommend that Scrum teams get started immediately and create a list of impediments and a process improvement plan. As engineering practices are identified as impediments, teams should look to XP practices as a way to improve. The best teams run Scrum supplemented with XP practices. Scrum helps XP to scale, and XP helps Scrum to work well." "What's happened is that they haven't paid enough attention to the internal quality of their software. If you make that mistake, you'll soon find your productivity dragged down because it's much harder to add new features. You've taken on a crippling Technical Debt, and your scrum has gone weak at the knees." "Few implementations of Scrum achieve the hyperproductive state for which Scrum was designed (5-10 times normal performance). Those that do all implement variations on XP engineering practices"
My favourite book and blog on XP right now. "Ken Schwaber convinced me that Scrum would be easier to adopt and work anywhere if we didn't mandate specific software practices." "It is one thing to get to a reasonable functionality in a short time, and another one entirely to build a piece of software that can be maintained or worked within a team over an extended period of time. It is all too tempting to leave working code as-is, without refining it or improving it in a timely fashion. And before you know it, someone else has picked it up, or you have picked it up again, copy-pasted it (god forbid!) or increased its complexity where there would have been a simpler solution would you have given it some more thought."